Once again we’ve got together with architect and long-time collaborator Derrie O’Sullivan, as part of a Design & Build project led by us. Derrie has taken the project through to Planning and is joining us for monthly project meetings, helping us with any architectural and aesthetic issues that arise. 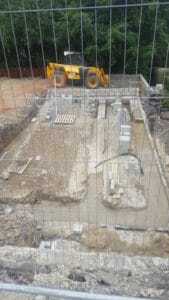 The project is once again going to be built using cavity wall masonry onstruction. with Yorkshire stone, which was decided early on by Derrie, the clients and the planners. I am happy with this as it’s easy for us and allows us to continually refine and tweak our cavity wall Passivhaus methodology. This time, to meet planning requirements, the project needed to have a flat roof, to prevent blocking view of neighbouring houses, so that will, obviously, require different detailing. The house is approximately about 120 m2, in a very simple rectangular shape. 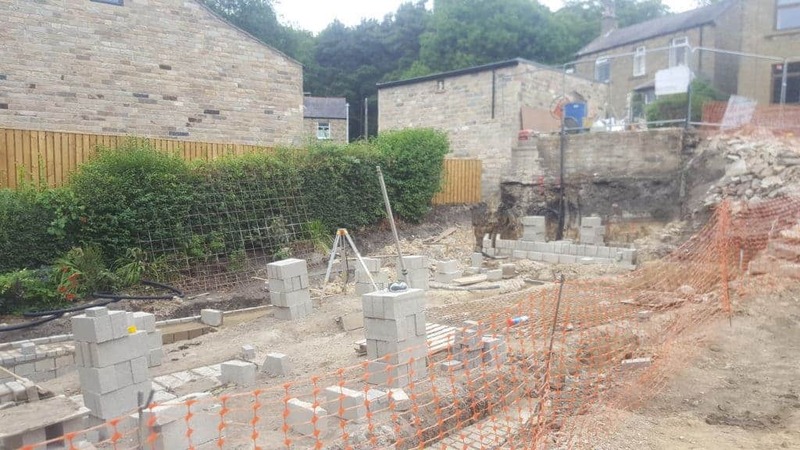 Because it is set down in the garden, there is a separate retaining wall, similar to Golcar. Like Golcar it is an ‘upside down’ house with a bridge across to the entrance door. There is a large living/ dining kitchen area on the first floor as you come into the house across the bridge. The living room has an L-shaped balcony which acts as shading for some of the ground floor rooms, and will have a lovely view. The ground floor has 2 bedrooms, a bathroom and a garden room. The garden is a very important element for the clients. Our good friend Nick Grant has put a lot of work into promoting true Value Engineering. We’re going to try to value engineer this project tightly. At our Golcar Passivhaus project we overshot the Passivhaus criteria in a few ways in terms of energy efficiency and airtightness (eg following a change of specification of windows, having better PSI values at junctions, and with an airtightness of 0.25 rather than the 0.6 that we modelled in PHPP). We need to be very careful when designing in PHPP. At the moment we’re at 14 kwh/m2/annum with a 0.4 air changes. 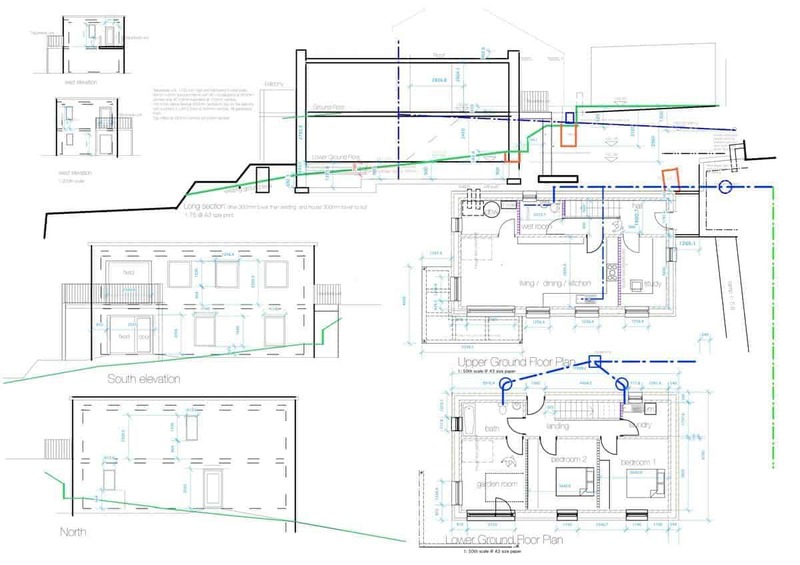 We’re pitching the airtightness at 0.4 within PHPP because we’ve got a track record of achieving good airtightness and are confident we can do so again on this project. For cost and aesthetic reasons we’re simplifying the window installation detailing which increases the thermal bridging and PSI values at that junction so we’ll need to design in some negative PSI values on other junctions where we gain more. The main challenge with this project is that it’s sheltered by the trees so solar gain is bad. We’re having to be very careful. For the good of low energy construction we’ve got to make these buildings affordable.. keeping the costs down through value engineering. So our approach this time is more refined and sophisticated than at the Denby Dale and Golcar projects, building on our experience and knowledge and by careful design detailing at early stages. The foundation detailing is similar to Golcar and Denby Dale. We’re using the same principles of taking the insulation down to the strip foundations and using an aerated brick (Celcon thermal block) to reduce thermal bridging. BUT there is a big difference – the ground conditions are clay and the structural engineer has recommended using Cordek underneath the slab. This has meant we’ve had to change the order of things which has had a knock-on effect on our airtightness strategy. 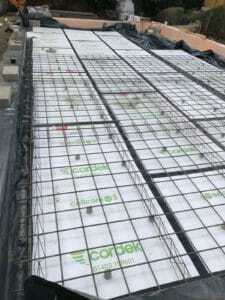 At our Golcar and Denby Dale projects the slab was on top of the insulation – the slab was ‘power floated’ – but in this one we’ve got more complications as the insulation is on top of the slab. 75mm screed (floor finish made of sand and cement giving a smoother finish). Having to use the Cordek throws up questions about airtightness in the detailing. We’re taking the airtightness strategy below the insulation, which we don’t feel is a risk in terms of interstitial condensation because the ground temperature is never less than 10 degrees. 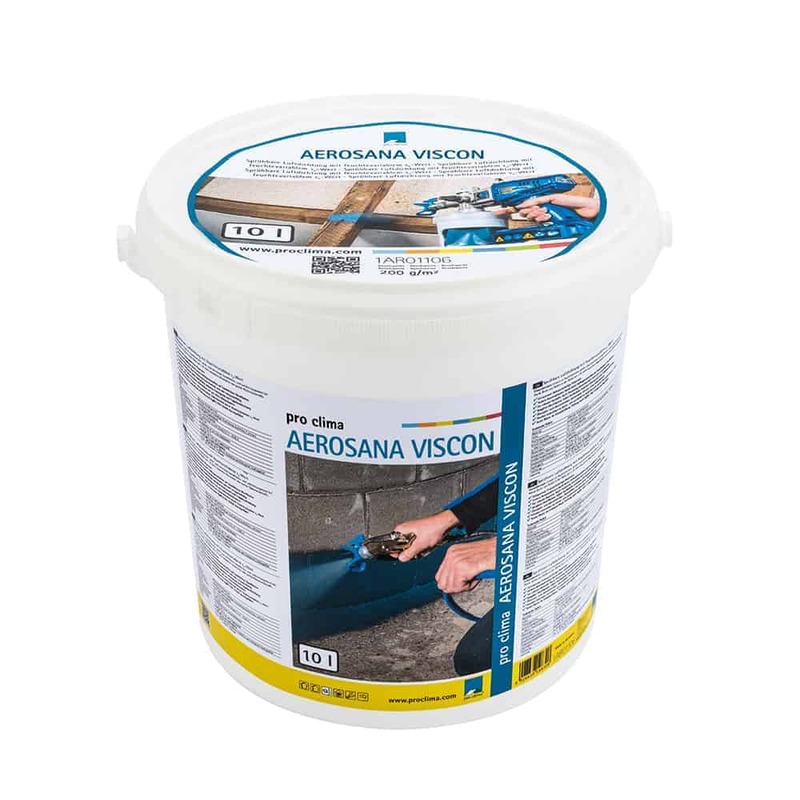 I’m proposing to use Pro Clima’s Aerosana Viscon paint/ spray as the airtightness layer up the wall to the top of the slab, meeting the wet plaster. It will actually be on the cold side of the insulation so in theory warm moist air could condense. I’m pretty sure that it’s not going to be a problem as we’ve got all this detailing to prevent thermal bridging and keep the ground warm but we’re going to tape the top layer of the PIR insulation with Pro Clima Tescon Vana tape as a vapour control measure. Alternatively, we could have added in an airtightness membrane between the screed and the slab but the membrane would then be subject to many pressures by being trampled over so we’ve decided to go down the taping route instead. We’re looking closely at this detail to make sure it’s OK.. From a value engineering point of view this seems like the best strategy. This is another case of building on our the experience at previous projects. In the next blog we’ll look at the radical changes to window detailing we’re making and our strategies to prevent overheating at the project. Visit the construction site of the Kirkburton Passivhaus during the International Passivhaus Open Days in November 2018. On your sketch, it shows full fill cavity insulation, above DPC, I have worked for various organisations who have had serious issues with full fill insulation. In Scotland I believe there is difficulty with their regulations but in the rest of the UK it is a generally accepted practice. In our own now long experience we have not had any problems and we live in a high exposure area on top of the Pennines building with a porous sand stone. Using forgiving lime mortars also helps. Full fill cavities with the correct material can fail because of badly installed wall ties, cavity trays and the bridging caused by mortar droppings. A 300mm cavity construction allows ease of access to keep the mineral wool clean of droppings particularly if the inner leaf is put up first and allowed to set. The mineral wool batts are woven vertically and designed to get damp in the first 15mm drying out through the vapour open structure in better weather. As always good workmanship is key. A cavity wall was introduced because of a few issues with single leave walls. 3 it can vent out any water coming through a single leave, traveling down to the doc and hopefully get a chance going out again. Fully full a cavity can bring back the problems of moisture transport. It also takes away the ventilation. Last but not least, the bricklayer should have some space for his fingers to properly finish his masonry. A much better detail and insulation would be achieved by leaving a 20mm space between the insulation and the outer leave brick. (20mm would give enough space for a finger). Also, the insulator is in 2 layers. Fine but NEVER have the joints in the same position but create a half sheet overlap. I agree with your analysis on why masonry cavity wall was developed because of the obvious historical difficulties with solid wall construction. How much a cavity is ventilated is questionable. For example, traditionally in the UK the cavity was closed off at the eaves to inhibit bird ingress etc. However, even without through ventilation we know that closed loop thermal bypass, the transfer of heat through natural convection, is a problem contributing to the performance gap between a U value on paper and its true performance. 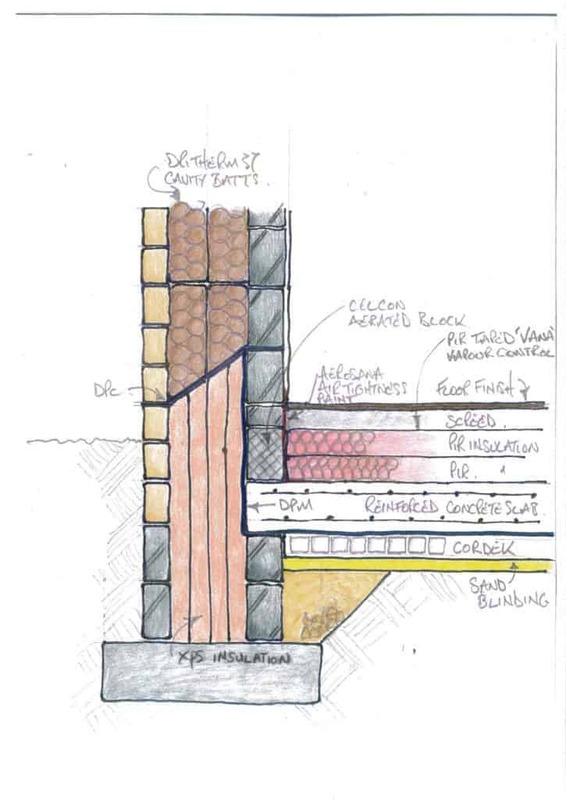 Please refer to the excellent paper by our friend Mark Siddall https://www.aecb.net/publications/the-impact-of-thermal-bypass/ A flexible material such as mineral wool will be able to mould itself to the inevitable imperfections of masonry construction which rigid board cannot. Also, from a buildability point of view I disagree with your argument for a 20mm cavity. Bricklayers cannot overall keep cavities clean of mortar droppings onto the wall ties and cavity trays even at 50mm. The mineral wool batts are supplied at a 450mm height which correlates with two blocks and in our case three courses of 150mm stonework which is also the standard height necessary for wall ties. We use the Teplo wall ties to minimise thermal bypass. Being a soft material, we do not think horizontal joints are an issue, the vertical joints are overlapped. From experience we build the inner leaf first, then 450mm of the outer leaf leaving to set, clean any mortar droppings from the top of the previous layer of mineral wool then pull/push in the next layer. We know from other projects where the masonry has not been allowed to set the mineral wool can push the ‘green’ masonry out particularly with rain penetration. Please refer to our previous blogs on the Denby Dale and Golcar PassivHaus projects. To confirm the effectiveness of the whole system DriTherm products are tested in an extremely severe rain penetration simulation before they can receive their BBA Third Party Certification. In this test a cavity wall with an highly porous outer leaf is subjected to water and wind pressure representing an approximately 1 in 100 year storm event for 6 hours every day for 5 consecutive days. The insulation is installed fully against the outer leaf and the inner leaf is monitored for moisture and fails if any is observed.